I am only 5 ft tall so this bike fits me well. Have customized her with every chrome gadget I can find plus a really glitzy paint job and custom seat. very comfy for long trips and makes a statement about how much I love my girl. I am the same height as you and have the same bike. Mine is candy apple red and I'm looking to do some customizations to mine. I just had to tell you ... that is one BEAUTIFUL ride you have!!!! No, it wasn't ANYTHING like boot camp. Your bike is beautiful! My favorite color is purple. I just took the 2 and a half day safety course and passed! It was a little like boot camp. It was very fun and informational. I have never driven a standard, so that was a little challenging. I keep letting the clutch out to fast and stalled. I got the hang of it. I was great after I got going. Boy what a work out I got. My left side is sore from my clutch hand to the shifter foot. Everyone riding a two wheeler should take this class! They should also put a larger section in the study guide about motorcycles for learning to drive a car. The class definitely made me more aware even driving my truck. The tank for my bike is getting painted. I can't wait to see it on and get to practicing on my own bike. 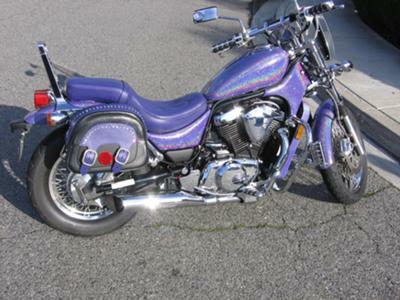 Purple is my favorite, and the iridescent look of your bike is REALLY sharp! I have an '06 C50 and lots of chrome myself - of course, I keep a soft cloth in my bags just to shine her up a bit every time we make a stop! Beautiful bike you have here. I meant to post to you before, how great it is you are an instructor, especially for the ladies, at such affordable rates. Here in Illinois MSF is a $20 donation through our universities, and worth more, as we are licensed at completion (assuming we have mastered some basic skills!) But if I had needed to fork out the $300 through an HD dealer, I'd still be just looking at my ride, or taking pointers from all the wrong people. Funny thing though; as soon as I was finished with the course, I felt like EVERY driver of EVERY kind of vehicle would benefit from such a course, just to raise awareness of us smaller forms of transportation out there. I suppose semi drivers feel the same about everyone learning about big rigs...even though we SEE them, we assume they can stop like a regular vehicle, etc. Anyway, learning a bit about how to control all types of vehicles, whether we ever intend to actually drive/ride them or not, would seem to really raise awareness and safety...but maybe not. Aggressive drivers, those guys who dodge and weave and spend all their time just getting ahead of one more car are never going to really go away. And neither are cell phones while driving... :( So it's a good thing there are people like you willing to share your wisdom with those of us who DO want to have fun without killing ourselves!